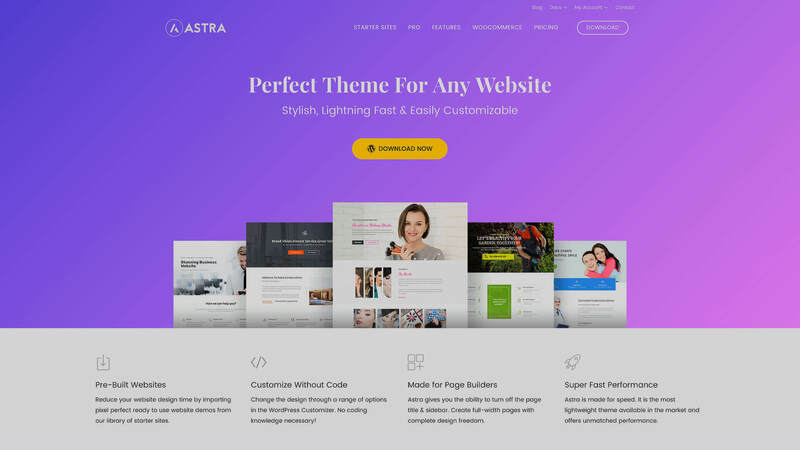 Astra WordPress Theme: more than just a theme? Do you still need a wordpress theme if you are using a theme builder like Elementor Pro? In this video, I will show you why I love the Astra Theme and why you should too! Social media or not, your website is still the cornerstone of your business. So if you use WordPress you may be wondering if the choice of a theme is still important, since page and theme builders can now handle many things on their own. Well they do because some things are best left to be handled by themes. In this post, I’ll share with you 5 reasons I love the WordPress Astra Pro Theme and why you should too! 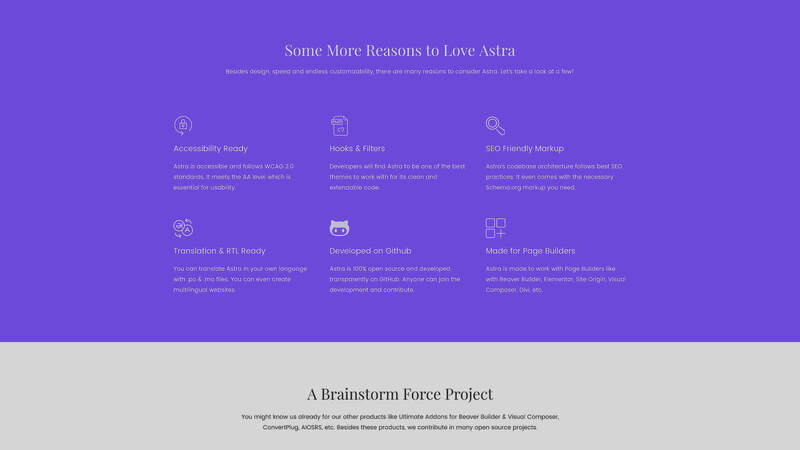 Astra Pro for WordPress is made by the good people at Brainstorm Force. – plus: all of their future plugins! If you’re serious about creating websites for clients, and make a living out of it, then I recommend their Agency plan: while it may look expensive it’s actually ridiculously cheap when you consider what’s packed in it, and if you want to play it smart, you should get their Agency Lifetime plan! Yes you heard right: lifetime. And this will pay itself on the very first website you sell! No brainer in my opinion, so get yours while you can because they’ve mentioned a couple of times that the lifetime plan may disappear in the future. 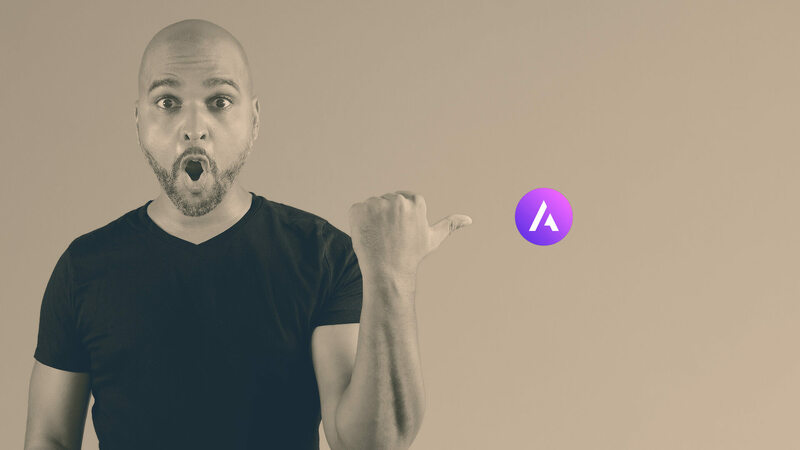 According to Brainstorm Force, Astra for WordPress needs less than 50KB of resources, compared to the minimum of 300KB that most WordPress themes require. Also, with the default WordPress data, Astra loads in less than 0.5 seconds! You can activate and de-activate features at will in the backend, and I personally love this feature because it helps optimizing your website. For example, if you’re going to use a theme builder like Elementor Pro, why would you want to load the “Blog Pro” module from Astra Pro? Just de-activate it and voilà, it would unnecessarily bloat the code of your pages! The page headers feature allow you to create and display different headers and logos on the same website. So for example, if you want to create a custom header with transparency, a light-colored logo and the navigation in light gray only for the homepage, that’s possible. And if you want to create a custom header with transparency, a dark-colored logo and the navigation in light black for another page, that’s also possible. That’s pretty handy for example when using “Hero sections” (sections with a big fullscreen image) at the top of your pages, and you want to be able to change the header’s color scheme based on the background image. Custom layouts allow you to inject content or code to specific spots on your website. And with the help of WordPress hooks that you can select from the back-end, you can precisely define where you want to add code or content. Easy! Just create a custom layout, design your banner with your page builder and then specify publication rules (display on the whole website for example). Then once Black Friday is over, you can just de-activate or delete the custom layout, and your website is back to normal in a few seconds! The Custom Fonts plugin is free and allows you to easily add custom fonts to your Astra powered website. I love that little plugin, even though yes you can do that with simple css, but I find it much more manageable in that interface. All you need to do is specify a name for your font, and then upload the various formats of that font (.woff, .woff2, .svg, and so on.). And the added benefit is that once you add your custom fronts through this plugin, they are now selectable throughout your website, in the Astra settings and even in some pagebuilders (like Elementor if you let Astra take over Elementor fonts in the options). 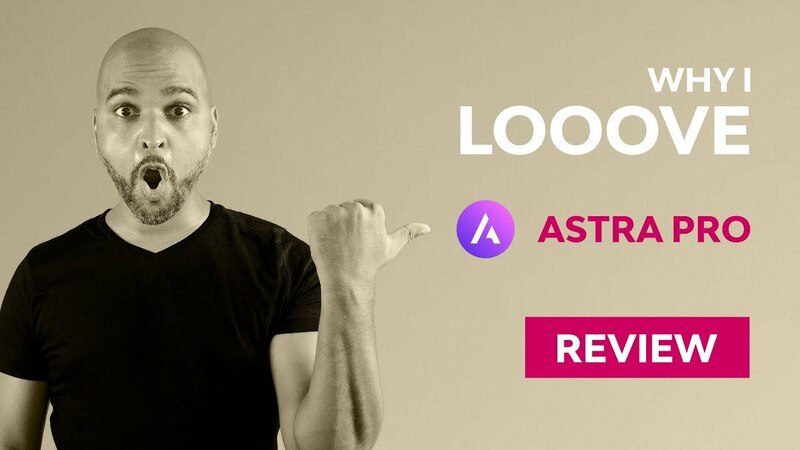 Last but no least: Astra Starter Sites is available for both the free and pro versions of Astra, but you get some exclusive content if you have an Agency license. Astra Starter Sites is a library of pre-made websites (thus including several pages) that you can import and activate right from the comfort of the WordPress backY-end. You can also get some layouts with Elementor blocks and layouts, the Envato Elements WordPress Kit with a ton of sites layouts and blocks, Crocoblock, and some others. 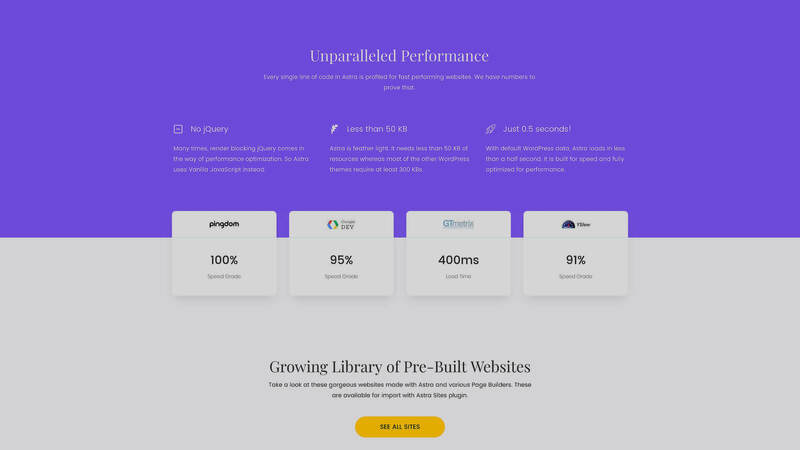 But since Starter sites was developed by Astra, it’s convenient to have great looking starter sites that you know are 100% made to work with Astra and your favourite page builder. Personally, I prefer creating my own designs, but it’s great to have a starting point or some kind of inspiration. Also, depending on your client’s budget, it can be a way to offer great looking websites while cutting the design and development time so that the project is still profitable. Currently, Astra is compatible with Elementor, Beaver Builder, Thrive Architect, Wp Bakery, Divi and Brizy! Now, most likely, you already have a page / theme builder of choice. But as things evolve fast in the digital age, how can you be sure it will still be relavant couple of years from now. I mean 2 years ago, not many people knew about Elementor, and look today. So it’s nice to know that, should you switch page/theme builders in the future, first of all, it will be compatible with Astra, and also, that you won’t have to go through the process of learning how to use a new theme all over again. Yes, there is a learning curve to master Astra, just like with most things in life. But it is an easy one, and it won’t take you long before you know the ins and outs of this great WordPress theme. 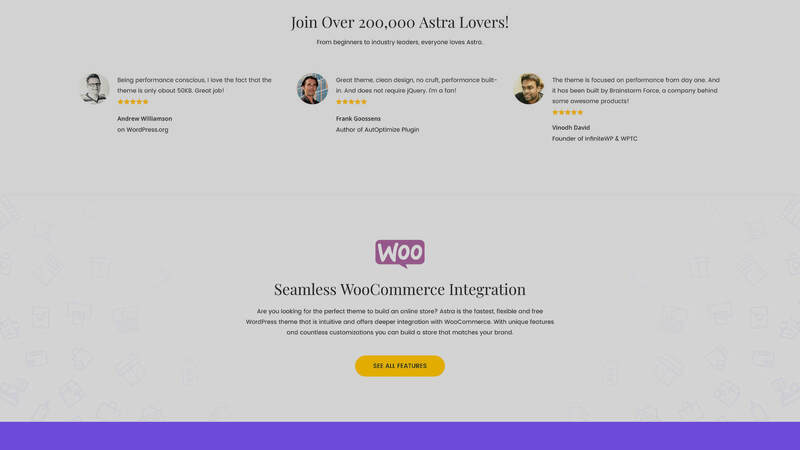 If you use a theme builder like Elementor Pro, you may be wondering what’s the use of Astra Pro since you can style many parts of a Woocommerce web shop with Elementor Pro. Well, things may evolve, but at the time of writing this, for example, you can’t yet style the checkout and cart pages with Elementor Pro, while you can with Astra. Of course, not with the same level of customization, but still a very interesting option if you are not a developer or don’t have the budget to hire one. And if you don’t use a theme builder, then you’ll be happy to know that you can style many parts of a Woocommerce web shop like the shop page, the single product page, and more. Astra WordPress Theme Pro Version: What About You? So, I hope that this video helped you understand why the Astra theme is a great asset to have in your arsenal! Now I’d be curious to know what is your favorite feature about Astra Pro, or if you don’t use Astra Pro, what is your favorite WordPress theme? Now if you want to brand, market and grow your business it in the Digital Age make sure you subscribe to my email newsletter so that you never miss your share of digital alchemy and tips, tools, services and case studies that can help you grow your business online. So, that’s it for this episode, I hope to see you around here or on the Youtube channel, and in the meantime, don’t forget to invest in YOUR success!